On this day in 2009 The Renaissance Mathematicus first crept warily out into the vast depths of cyberspace. As it’s our third birthday I decided it’s about time to talk about our blog banner. With the exception of a short period where my banner was a photo of the Schnuppy Puppy to honour her passing, The Renaissance Mathematicus has had the same banner since the day it was launched and will continue to do so as long as it exists because this banner perfectly represents many of the things that this blog is about. Now most people don’t pay much attention to blog banners. They might glance at them casually in passing before settling down to read the newest postings. I had a nice anecdotal proof of this as one of my regular, normally attentive, readers actually asked me whether the building displayed on my blog banner is still in existence. So what is it? The picture, which I took myself, is of the pink wall of a building displaying a bronze plaque. Apart from the name in the middle, written in gold, the plaque is not readable in this photo so here is a close up. 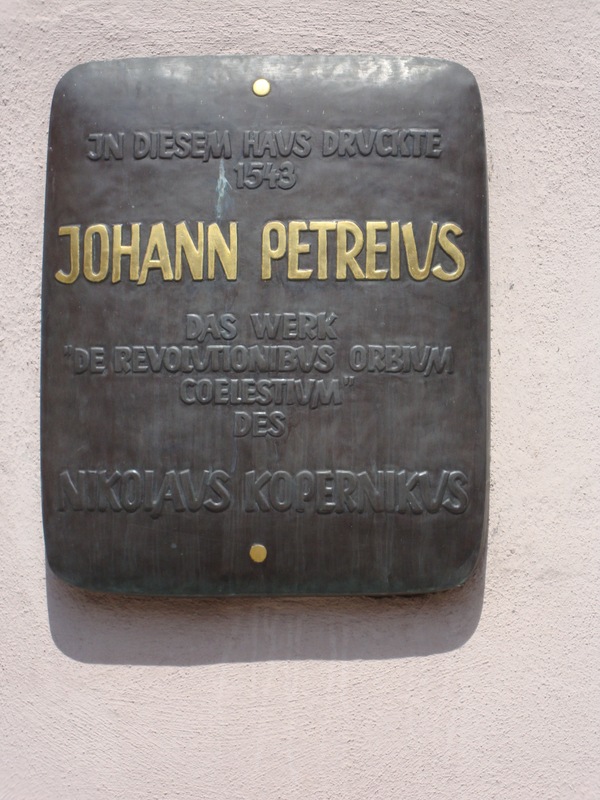 Translated into English it reads, “Johann Petreius printed in this house in 1543 the work De revolutionibus orbium coelestium of Nicolas Copernicus. 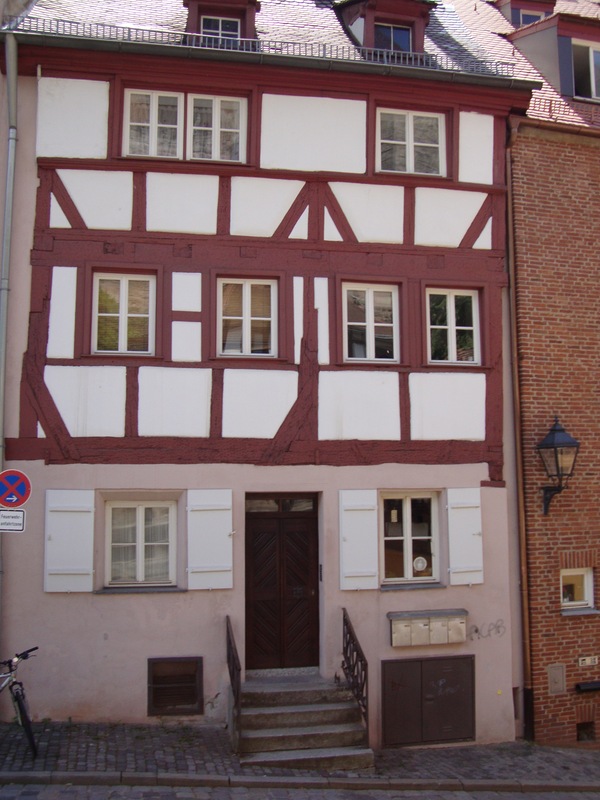 The house lies between two narrow parallel streets on the hill just beneath the castle above the City of Nürnberg. But who was Johann Petreius? He was born Hans Peter the son of Petrus Peter the younger in the Lower Franconian village of Langendorf near Hammelburg in 1496 or 1497. The Peters were a family of wealthy farmers. That is, as is unfortunately often the case with figures from the Renaissance, all we know about his childhood and his early education. He matriculated at the University of Basel in 1512, graduating BA in 1515 and MA in 1517. He next appears as a witness in a court case in Basel in 1519, where he is described as working as a proof-reader for the Basler printer publisher Adam Petri. This explains why he had chosen to study in Basel, as Adam Petri was his uncle. It pays to take a short look at the Peter/Petri family of printers as they played a significant role in the early history of academic printing. Hans Peter’s great uncle Johann Peter (born about 1441) left Langendorf with his, then six years old, nephew Adam in 1560. Family legend says that he travelled to Mainz where he learnt, the then very new, art of printing in the workshops of Gutenberg and Furst. In 1480 we find him established in Basel as a partner in the printer publishing works of Johann Amerbach (born about 1440) a native of Amorbach in Middle Franconia. Here Johann and Adam changed their family name to Petri, which is the Swiss-German form of Peter. Around 1490 they were joined by Johann Froben (born about 1460) who was the nephew of Veronica Froben from Hammelberg, Hans Peter’s grandmother. By the death of the three founders, all of whom died around 1512, the Petri-Froben-Amerbach printer publisher cooperative was the most important publishing house in Basel. Erasmus worked for them as a proof-reader and they were also his publishers and later, the then unknown, Hans Holbein the Younger worked for them as an illustrator. After the death of Johann, who had no surviving children, Adam took over the Petri family business and it is from him that our Hans Peter learnt the printing trade. After Adams death his son Heinrich took over the business and Adams widow Anna Silber married the cartographer Sebastian Münster. Heinrich Petri published Münsters Cosmographia, which with a total of at least 120 000 printed copies in the various German and Latin editions was the biggest selling academic book of the 16th century. 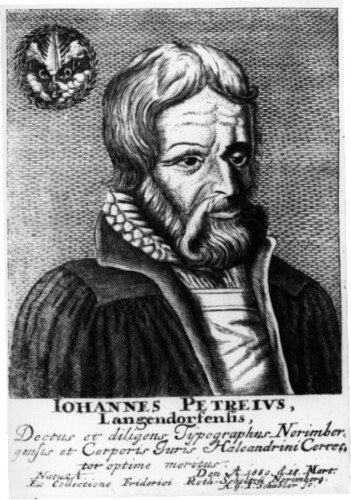 In 1523 Hans Peter left Basel and set up in Nürnberg as a printer publisher under the Latinised version of his name Johannes Petreius. He is first registered in the city records as a “puchtruker” (Buchdrucker i.e. book printer) in 1526 but it is known that he had started printing at least as early as 1524. It is not known exactly why he moved to Nürnberg to set up shop but I have a personal theory to explain this move. To understand we need to take a brief look at the history of printing in Nürnberg. Book printing first took off in around 1450, as Gutenberg printed and published his Bible and it spread incredibly rapidly to all of the major German cities. Nürnberg, which was then the second biggest German city and probably the richest, joined the party surprisingly late with the first printers setting up around 1470. There were three of them, one was Regiomontanus whose printing activities I’ve written about before and one was Anton Koberger. Koberger is, of course most well known as the man who printed The Nuremberg Chronicle, the world’s first printed encyclopaedia. However Koberger was much more. By the end of the sixteenth century he was by far and away the biggest printer publisher in the world with a production that dwarfed most of his rivals. Now Koberger did not just print in Nürnberg. In those days there were no distribution channels for publishers, they had to sell their wares directly to their customers. To reach a wider public the printer publishers would carry their newest products to the book-fairs in Leipzig and Frankfurt where they would sell them wholesale to other printer publishers who would take them home to their own cities to widen the choice of books they had on offer for their own customers. Koberger widen his own distribution net by licensing the printing of his titles to printer publishers in the other major publishing centres. His licensee in Basel was the Petri-Froben-Amerbach cooperative. This proved a very profitable deal for both parties. Koberger died in 1513 and with his death his printing empire slowly began to disintegrate. I think Johannes Petreius was sent to set up his workshop in Nürnberg by his uncle Adam to try to win a share of the very lucrative Nürnberg market following the demise of the Koberger enterprise. 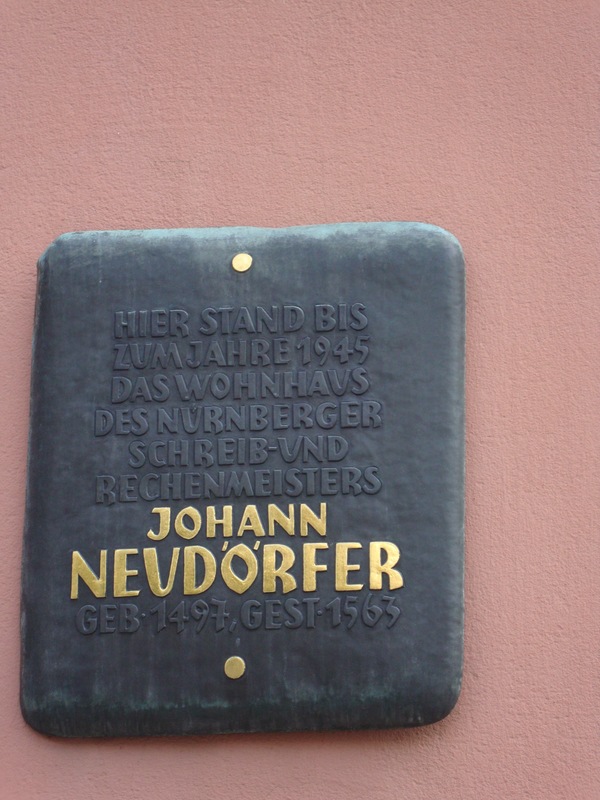 Sometime not long after his arrival in Nürnberg Johann married Barbara Neudörfer the sister of the writing and reckoning master Johann Neudörfer the Elder. Neudörfer is considered to have been the most important and influential writing master of the period and his books on the art of handwriting are beautiful works of art. As I have already mentioned in an earlier post on Albrecht Dürer, Neudörfer also created the fraktur font that was used to print Dürer’s maths book and although it was not the first fraktur font it is the ancestor of all subsequent fraktur fonts. When Petreius made those journeys to the book-fairs several times a year his brother-in-law managed the publishing house in his absence. If you go right when viewing Petreius’ house in the Obere Schmiedgasse about 100 metres to the end off the road you will see this house across the road. It too has a plaque like the one on Petreius’ house. Petreius did not find it easy at the beginning because there were several rival printer publishers eager to fill the gap left by the demise of the Koberger business. However he got a big break at the end of the 1520s when he won the contract to produce the first ever printed edition of the Roman Code of Civil Law. He was awarded the contract by the City Council of Nürnberg who also paid all of the production costs in advance for what was a very expensive undertaking. Petreius had no risk but reaped considerable profits, as the book became an unlikely bestseller. At this time many authorities throughout Europe were trying to set up their own legal codes and the Roman Code became a guideline for many of them. Also the kudos of having published such an important work raised Petreius’ status as a printer publisher. In 1533 he bought the house in the pictures above and in 1538 also the neighbouring house. In 1535 with the death of his biggest rival Petreius was finally established as the leading printer publisher of Nürnberg and thus one of the leading publishers in Europe. Apart from numerous pamphlets and other ephemera Petreius is known to have printed at least 550 books and it is estimated he probably printed something in the region of 800. Like most of his contemporaries the majority of his publications were theological followed by philosophical or historical works; however he was also one of the most important music publishers of the time. He is of course best remembered for the Copernicus book but that was by no means his only scientific publication. 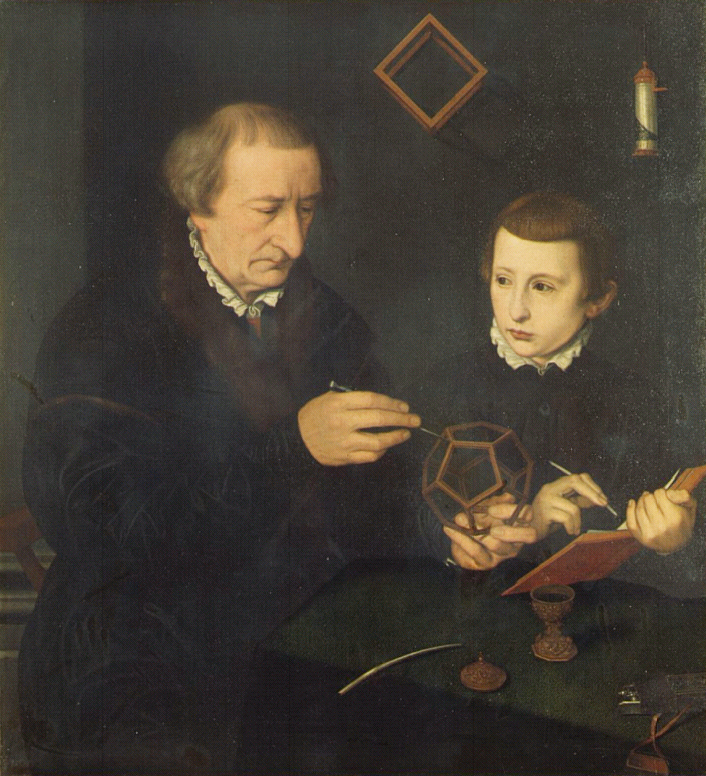 If Petreius had never published the Copernicus he would have still been the most important publisher of mathematical works in Germany, and possibly in Europe, in the second quarter of the sixteenth century. He published a large number of, largely forgotten but then highly important, astronomical/astrological works both from Greek and Roman authors as well as Arabic ones. Included amongst his astrological publications is the first printed edition of Ptolemaeus’ main textbook The Tetrabiblos, in a dual Greek/Latin edition. He published the mathematical, astrological and philosophical works of Cardano outside of Italy and the mathematical works of the German algebra pioneer Michael Stifel. He, also, commissioned and published the first German language edition of Vitruvius’ De architectura. He died unexpectedly on his way to the Frankfurt book-fair in 1550 and although his son in law took over his workshop his catalogue passed to his cousin Heinrich Petri, Adam’s son, in Basel, which is why the second edition of De revolutionibus was published in Basel in 1566. If you should ever visit Nürnberg take some time to walk up the hill to the castle and on your way pay some obeisance to the birth place of what has been called the most important science book ever published and to the man who published it. Wow, thanks! Very interesting post! Many thanks for this detailed and very interesting post! I had heard there was a familial connection of some kind between Petreius and the Petri printing house in Basel, but I had never before seen the details like you laid out here. There probably is enough material for an in depth study of Petreius. There is already a fairly substantial doctoral dissertation on his activities as a music publisher and various shorter works of varying quality on other aspects of his work. 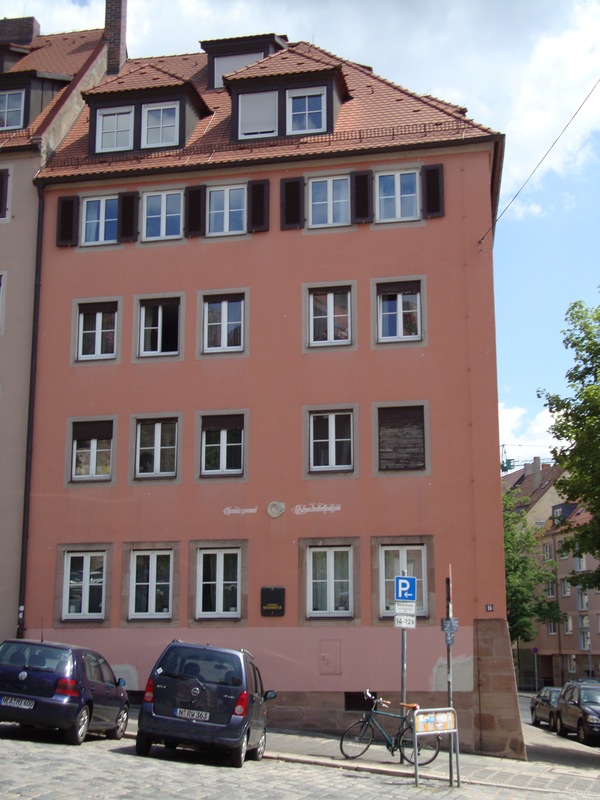 There is also still a fairly substantial amount of material in the city archives of Nürnberg. All it needs is someone with the time, the patience and the desire to pull it all together and write it up. However with at least 550 known publications it would not be an easy task! A really nice birthday posting for the blog! Any chance you’ll post a street map of the historical connections? (IIRC you said that Duerer moved at some point into Petreius’s house?) Anyways, greetings from Frankfurt! Greetings back from Spardorf! Your memory is slightly faulty, I’m afraid. 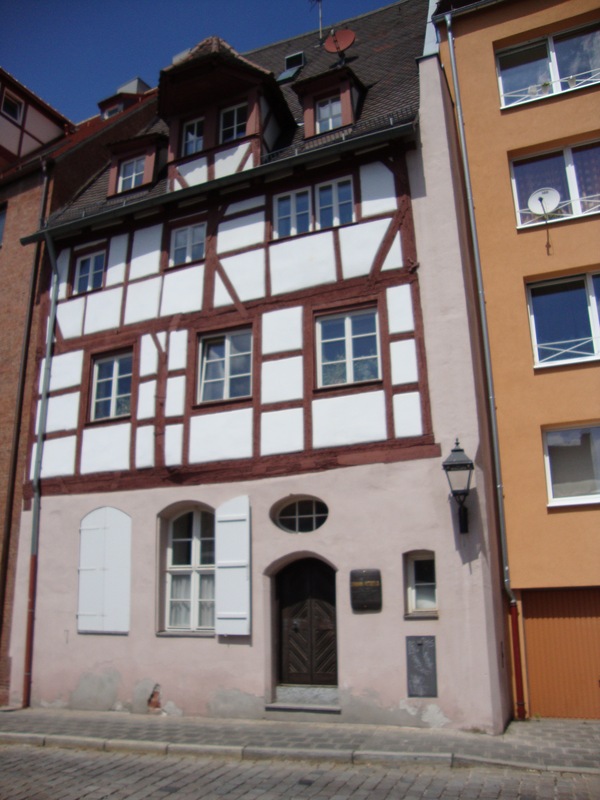 The Dürer House, which is just around the corner from the Petreius House, had previously been the abode of Bernhard Walther who had been Regiomontanus’ astronomical partner during his time in Nürnberg. I will almost certainly blog about Walther some day. Ah, bummer. Thanks for the correction. Our chat has been too long ago. I’ll keep reading, that’s gonna keep me up to date. Ben, you can find your street map with the history of astronomy information for Nürnberg here. A slightly off-track question, but not totally unrelated to the subject of your post: when were the plaques placed on these houses? I’m curious about the font choice on them! To be honest I don’t know but I’ll try to find out for you. An interesting account. On the history of Fraktur – I believe Prof. Johanna Drucker at U of California is hoping to produce a history of graphic design and type innocations as a Web-based project (she mentioned it at Books in Browsers in SF a couple of weeks ago). It’s interesting to me that many of the most important publications and innovations came from the periphery of publishing, perhaps because new ideas are toxic to preserving status quo?